DARPA's Airborne Launch Assist Space Access program seeks to develop less expensive launch technology for small satellites. WASHINGTON — The commercial space industry can mass produce satellites that are small but quite sophisticated for the price. And launch vehicles are getting better and cheaper by the day. So it only makes sense for the U.S. military to ride that wave, said Steven Walker, the director of the Defense Advanced Research Projects Agency. Walker agrees with recent Pentagon and intelligence community assessments that outer space has become more militarized and U.S. satellites are vulnerable. This is a reality that DARPA predicted long before the Pentagon officially recognized space as a potential battlefront. "Space is going to be one of my priorities," Walker said Thursday at a defense writers breakfast meeting. "DARPA four or five years ago moved that discussion further along and we brought it to the attention of senior leadership all the way to the White House," Walker said. It was clear that "space was changing, that things were getting very contested and that the U.S. needed some programs to counter it." Many of the technologies being developed for space warfare are classified. But DARPA has been vocal about the need to get the Pentagon to become less dependent on large, complex satellites in geostationary Earth orbit. Walker said it's time for DoD to shift future spending to constellations in low earth orbit made up of dozens or hundreds of small satellites. Both DoD and the commercial sector have "very exquisite satellites," he said. They are high-performance systems but cost too much, and take too long to build and launch, Walker added. "We have been saying this for 10 years: We want to see a shift to LEO, get capabilities in larger constellations." The more satellites in the system, the harder it will be for the enemy to take it down, the thinking goes. 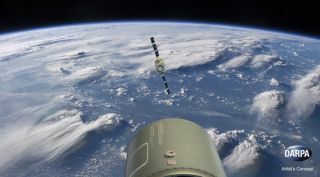 Larger constellations can be used for multiple missions, Walker said, and they could even "enable a battle management system for tactical war fighting on the ground," he said. "We've been talking about this for a while" but only recently have these ideas been taken more seriously. The challenge from peer competitors is increasing but the technologies that could help cope with threats are advancing, he said. "We have pretty capable small satellites." DARPA has invited companies to pitch ideas under a program called Blackjack. "We are looking at how we leverage the commercial sector at LEO, how we leverage the manufacturing of smaller cheaper satellite buses, and looking at how we put our payloads into those more affordable buses," Walker said. In a FedBizOpps announcement, DARPA asked for "innovative proposals" for low cost, mass reproducible space payloads and satellite buses. Interested contractors are invited to a briefing at the agency March 15. DARPA wants "commoditized satellite buses capable of hosting military payloads." The renaissance of commercial space, said the Blackjack solicitation, "has led to the design of numerous LEO constellations whose design and manufacturing methodologies potentially offer economies of scale previously unavailable." The intent of the Blackjack program is to "demonstrate a distributed low earth orbit constellation that provides global persistent coverage with a total cost of ownership that is less than a single exquisite satellite." Each satellite is envisioned to cost, including launch, less than $6 million. Walker said the Air Force is enthusiastic about the project. The service has been criticized for not moving fast enough to modernize space systems. Walker said that, in fairness, large organizations like the U.S. military services excel at what they do and are "wedded to the way they've always done business." DARPA was created to be "disruptive of that mindset and a partner at the same time," he said. "We find that is much more effective." The Blackjack concept is "getting a lot of traction, especially in the Air Force," said Walker. "I'm encouraged that we're going to move in that direction together." Separately from the Blackjack project, DARPA officials plan to brief contractors March 5 on the "future of space." The meeting is being billed as a discussion on "how to technologically and culturally disrupt the space enterprise, from the ground up," and how to bring about the "End of Battlestar Galactica." The idea is to get both the military and contractors to think differently about space capabilities, said an advisory sent to companies in advance of the meeting. The Pentagon's "risk-adverse processes incentivize performance over cost and schedule, further exacerbating the pursuit of monolithic, everything-to-everyone solutions." The current defense space architecture is "expensive, vulnerable, and technologically aging," said the advisory. "Historically, large launch costs have resulted in exquisite designs of capable, large platforms to better justify the high launch costs." Now is the time for the Department of Defense to "examine our enterprise." Walker said he is encouraged by the appointment of former NASA Administrator Mike Griffin as undersecretary of defense for research and engineering. Having someone in that position with an extensive background in aerospace and missile defense is critical as the United States faces competition from China and Russia in space and advanced weapons technology like hypersonic missiles, Walker said. "I am told that this is going to be one of his top priorities."